Syd and his grandfather share a world of imagination and endless, boundless love. Their houses face each other across their backyards, and Syd can use the key under the flowerpot. 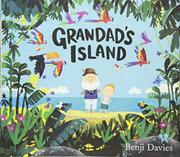 On this visit they travel together on a huge ship, launched from the attic, to a wondrous island filled with colorful, welcoming creatures, “a most perfect place.” Grandad decides to stay there, and Syd returns home alone. The next day he enters the quiet house, missing his grandfather. There’s a tap on the attic window, and there on the ledge is a note with a smiling picture of Grandad surrounded by friendly animals. Davies’ brightly hued, digitally created illustrations are sharply delineated and filled with myriad details that hint at magical qualities. The title page depicts Syd admiring Grandad’s sketches of birds and flora and a painting of a large rocky island, all of which are seen again as the subtly layered tale unfolds. Interpretations completely depend on the age and experience of readers. The youngest children will take it at face value as a sweet story of a boy whose grandfather is happy in a faraway place. Older children and adults may see a subtler message of coping with the loss of a loved one who lives on in special, joyful memories. Both characters are white with dots for eyes; Grandad’s whiskers frame his face from below, and Syd’s curly red hair frames his from above.